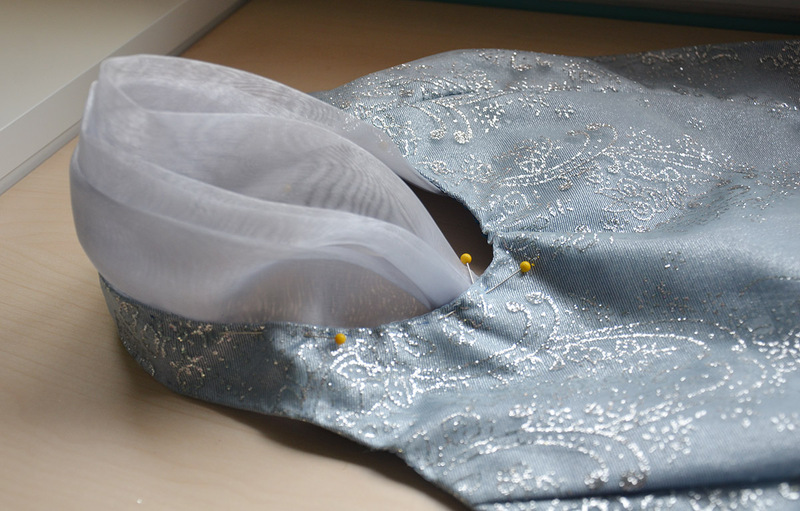 It has taken me a while, but here is the first post about making my Cinderella inspired dress! 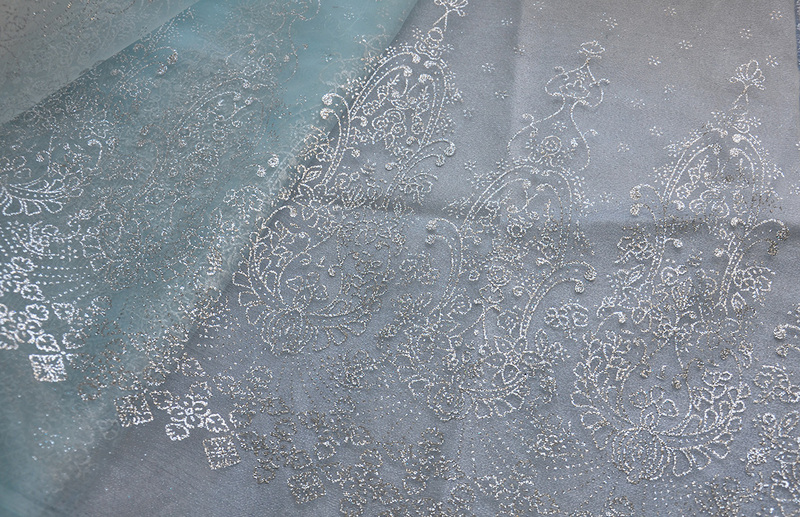 I was originally going to make a dress inspired by the live action ball gown (and I still intend to) but got distracted during fabric shopping by this lovely light blue and silver glitter organza. 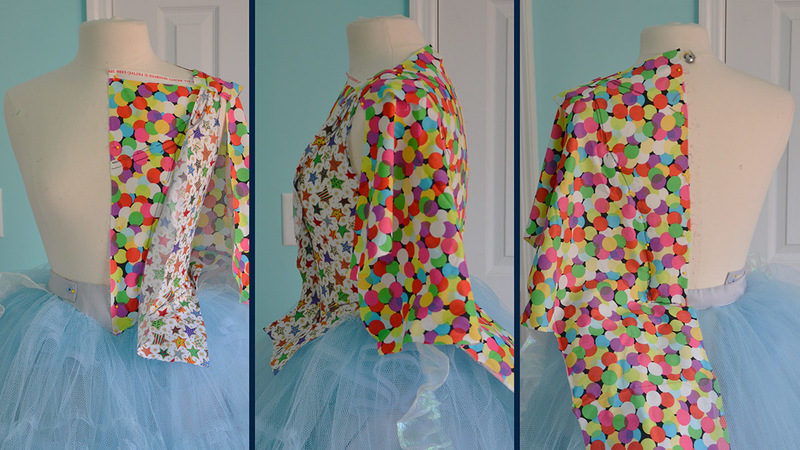 This fabric really doesn’t suit the dress from the live action film, which is why I decided to also make a version inspired by the dress in the animated film. Which is what this blog post is about! 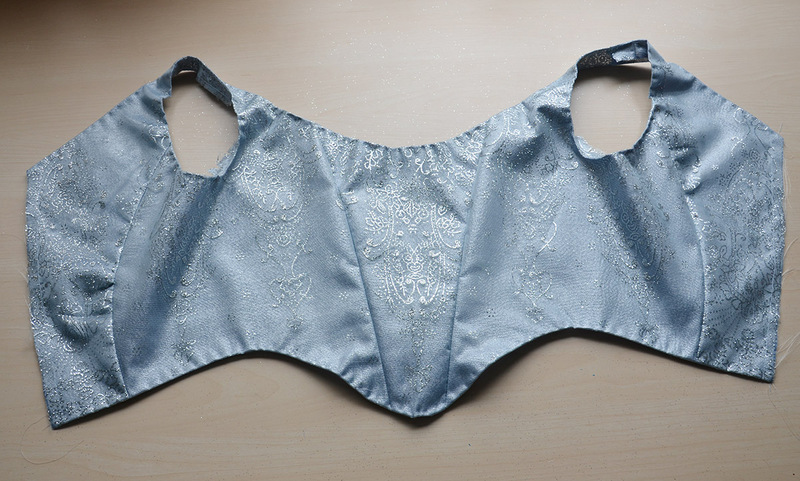 I purchased the glitter organza from Joanns and have paired it with a satin backed metallic grey fabric, which I bought ages ago at a shop in the NYC garment district. 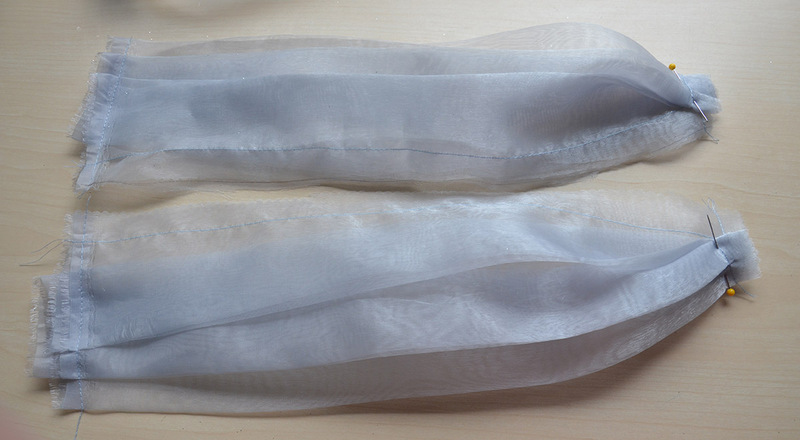 I’m also using a metallic fashion mesh (also from Joanns) and grey polyester organza (from onlinefabricstore.net). I had planned on reusing the pattern I made for my Halloween Inspired dress to make this one. After taking another look at pictures of Cinderella I decided against it, but I didn’t change my sketch to reflect that. 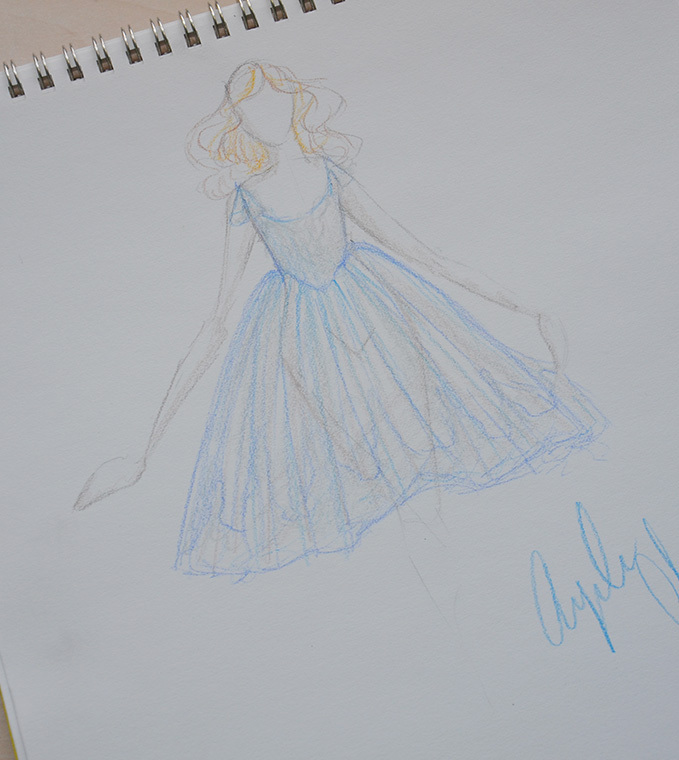 The sketch below was my original plan, which just so happens to look nothing like the finished dress. Once I figured out what the dress was actually going to look like, I draped the pattern. I did a horribly sloppy job of this, but I have an excuse! I was paranoid about accidentally snipping the petticoats so I didn’t trim excess fabric. Plus I chose really ugly scraps of material, it was practically doomed to look from the start! 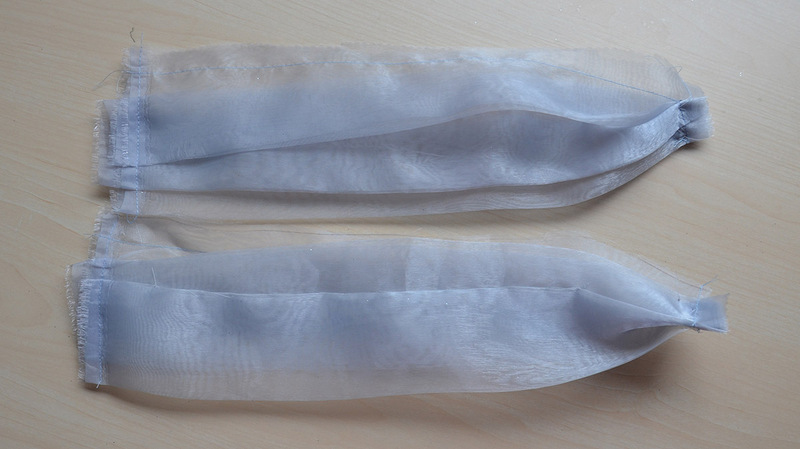 I draped this the way I always do – pieces of cotton get pinned over the form and pulled tightly. Then seam lines are marked and the process is repeated! This is what it looked like after removing it from the form and trimming away excess material. That got transferred onto paper and seam allowances were marked. I also labeled the center front and center back. And that was it! I had a pattern! I used that to create the mockup, which also features really ugly fabric! The mock up was too big so I took it in quite a bit. 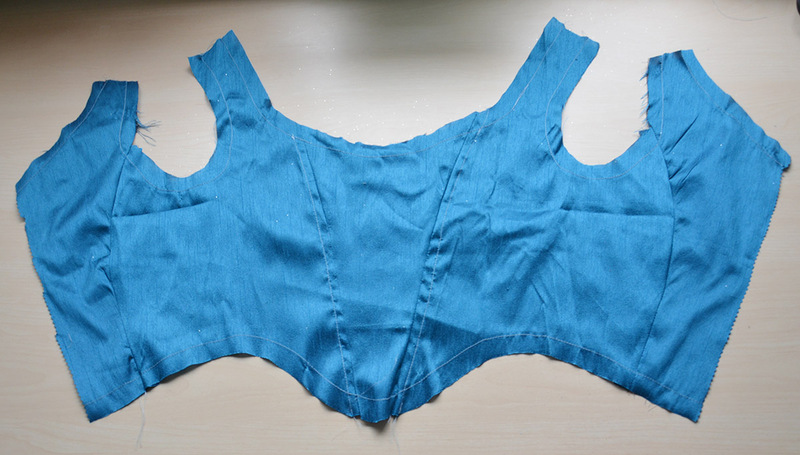 I also lowered the neckline and extended the basque waist. This is the new and improved pattern! 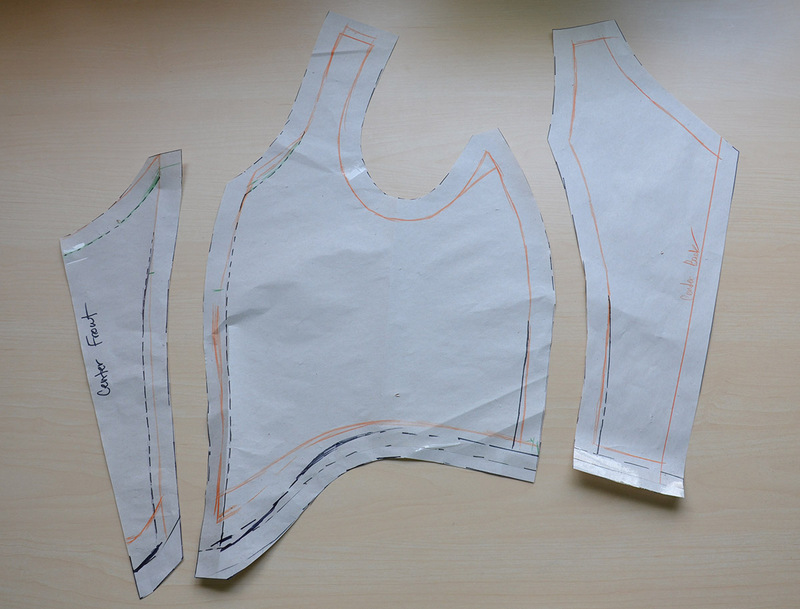 I used that as a guide for cutting out the bodice pieces from the satin backed metallic fabric. Once they were cut out, I laid the pieces underneath the glitter organza. I pinned the pieces to the organza and cut around them. With the pins still in I basted the layers together. I did this by machine because I was feeling a bit lazy that day. The point of this is to keep the two layers together during assembly, and it’s easier to sew the layers together than to deal with random pins sticking out everywhere. 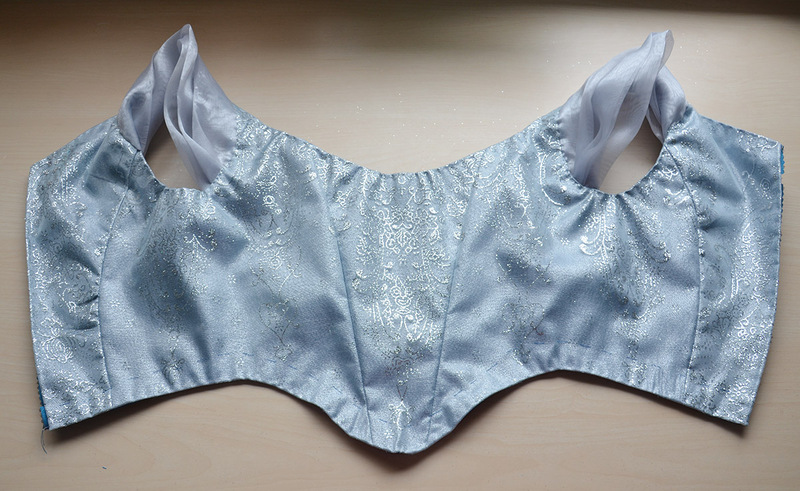 All the pieces got sewn together, and I had something resembling a bodice! When it was assembled I pressed the seams open, then used my sewing machine to stitch 3/4″ away from each edge. This will be used as a guide for hemming the edges. Speaking of hemming, the next step is doing just that! All the edges got turned inward by three quarters of an inch and sewn down. Then it was time to work on the lining! 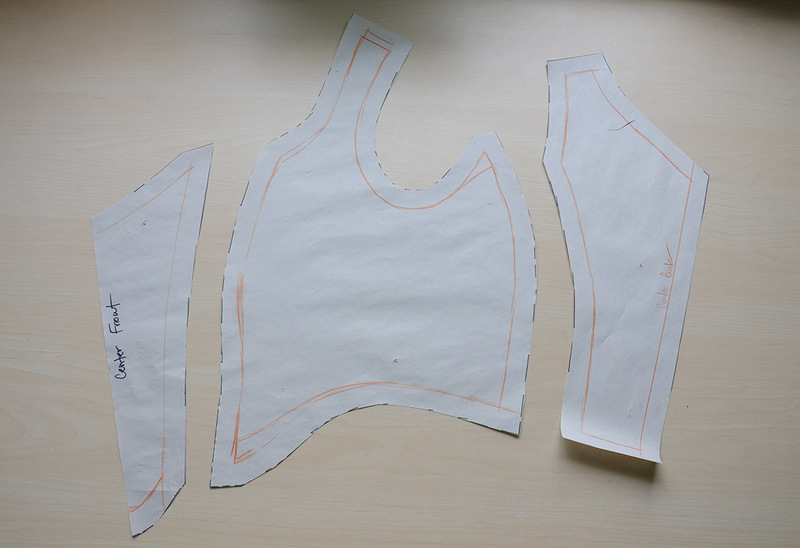 The lining pieces were cut out and assembled. I’m using polyester shantung for this, since i’ve had it in my stash for ages and wanted to use it for something. 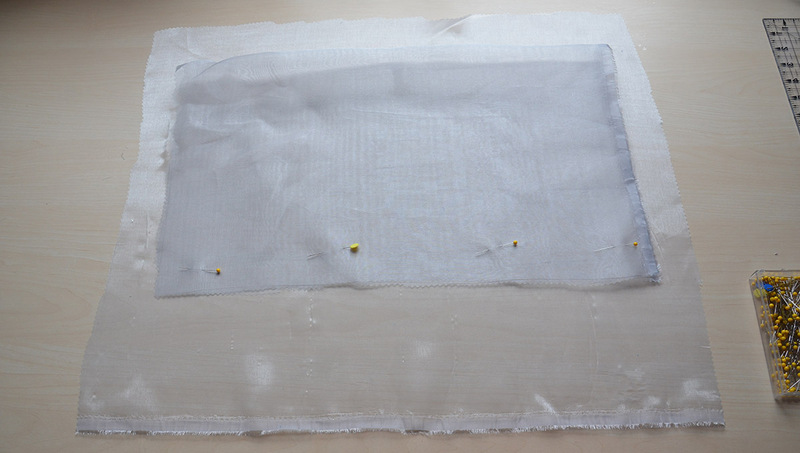 On the interior of the lining, after being assembled, the seam allowance between the center front panel and side panels got turned under and pinned down. I’ve always called this a flat felled seam but I know that isn’t the right term. It’s like a mock felled seam. But with the other edge pressed flat. Yeah. Regardless of what it’s called, once the folded edge is sewn down it will create a channel for boning! I also stitched around each edge, 3/4″ away from the edge. Like I said before this is for marking the hem allowance. With that done, I cut plastic boning to the right length and inserted it into the channels. Then I turned all the edges inward and sewed them down by hand. 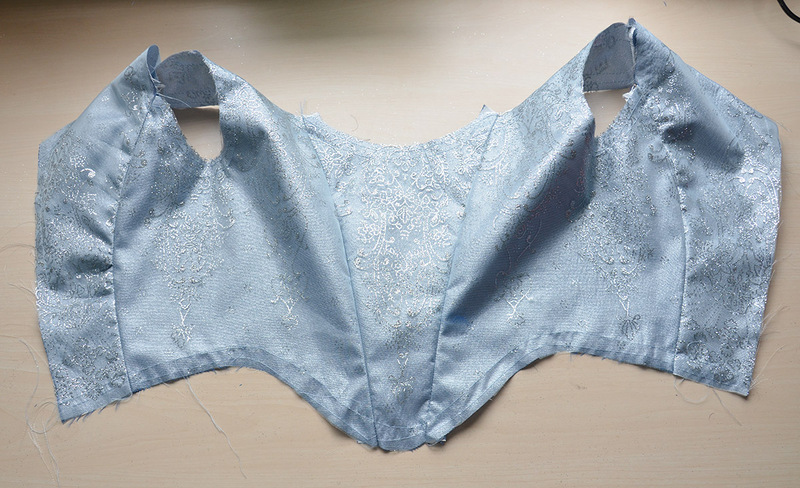 And it was finally time to attach the lining to the bodice! I pinned the layers together, starting from the centermost points and working my way out. 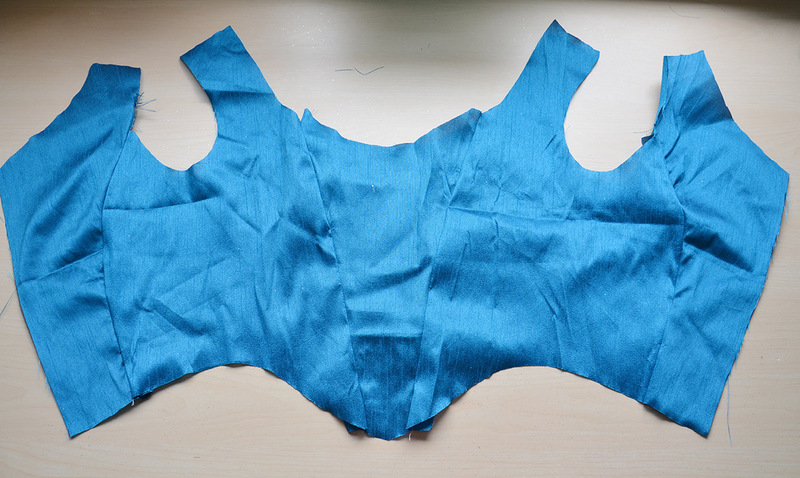 I left the center back edges open (the lining will be sewn to hide the zipper, after the zipper is attached). I also left the bottom edge open, well, kind of. I used large basting stitches to keep it in place, but it won’t be sewn down properly until after the skirt is attached. For all the other edges (the neckline and arm holes) I attached the lining with tight whip stitches. Now it’s time for the sleeves! I spent so long trying to figure these out, and even contemplated scrapping them entirely. But after a few hours I figured out a shape I really liked – and a very simple way to achieve it. 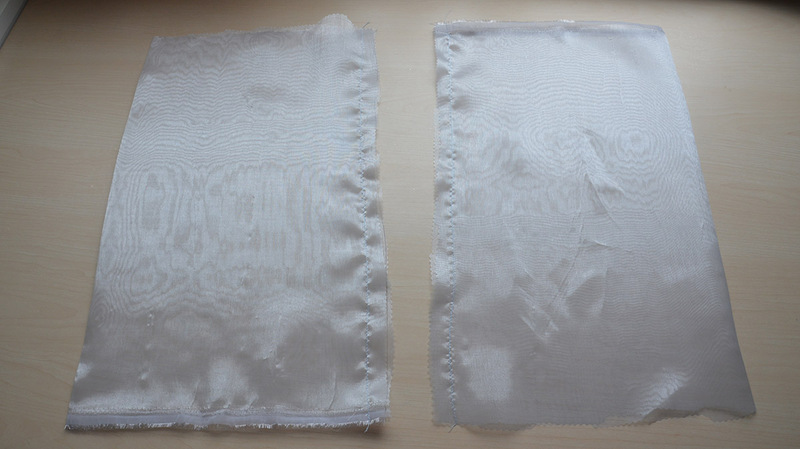 Each sleeve is made from two rectangles of organza. 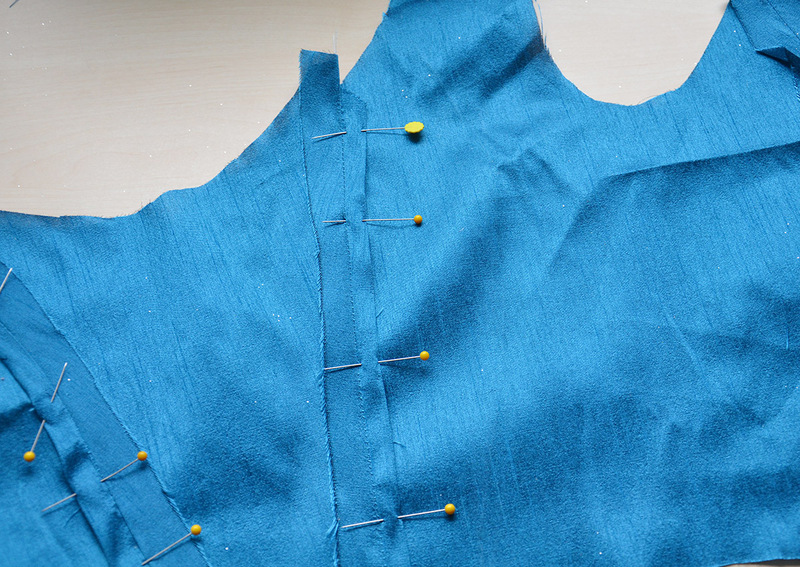 The rectangle gets pinned in half, and the pinned edge gets sewn shut. Then each end is folded into three 1/2″ knife pleats, which point towards the folded edge. Then one end (this end will be at the front of the bodice) is folded into another knife pleat, this time facing the raw edge. That gets sewn securely so the pins can be removed. 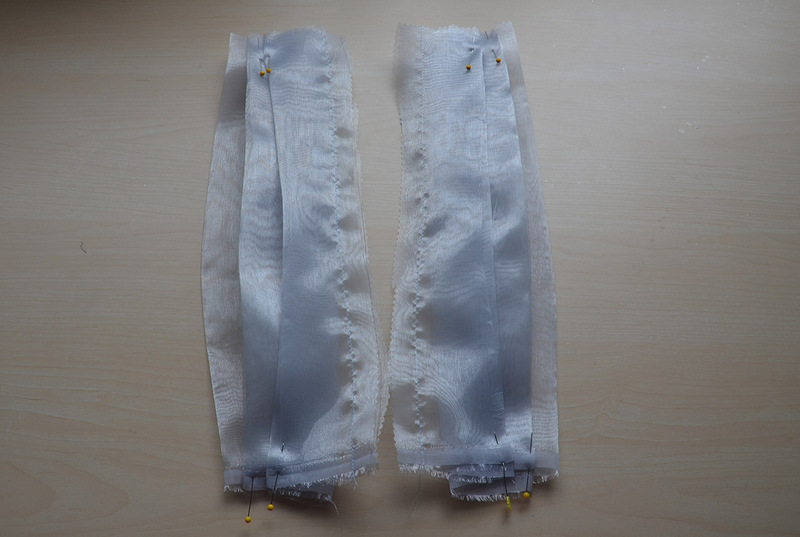 Lastly I tacked one of the pleats down, by hand, on the underside of each sleeve. This prevents them from losing their shape and flaring out into full rectangles. Each sleeve was pinned in place, with the folded edge facing outward and the raw edge being hidden by the interior of the garment. Well, that was my original plan, and that’s what is shown below, but I ended up changing it to make it more flattering. I felt this made my shoulders look very broad, which I didn’t like. What I ended up doing was having the sleeves extend over the strap, with the raw edges tucked into the neckline. 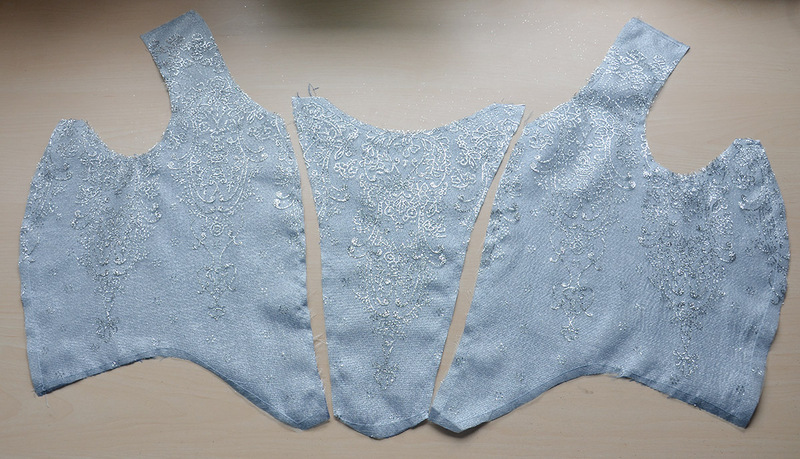 The sleeves were whip stitched on and the bodice was complete! It looks pretty puckery in the picture below, but those disappear once the bodice is worn and tension holds the edges taut. So that’s it! I also have a video showing this process, it’s posted here if you are interested in watching! Thanks for all the details!! I’ve always wondered how sleeves like that are made 🙂 Quick Question: What do you use for boning? (plastic, metal or hooping wire?) Thanks! I love this! 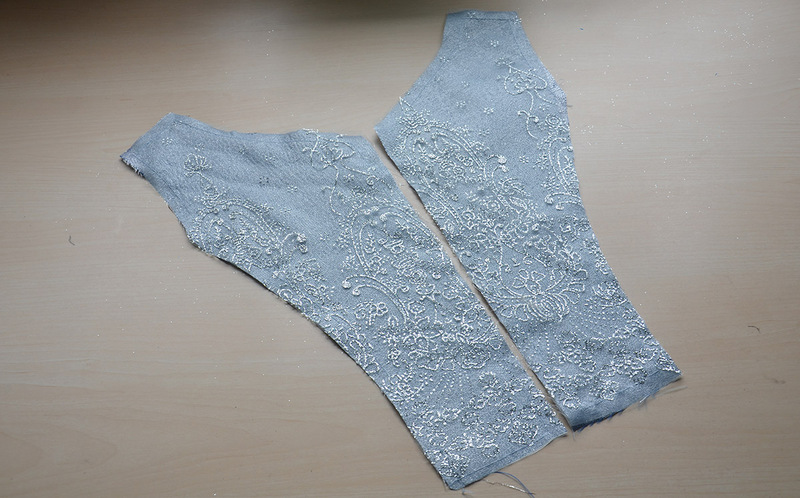 The organza goes so well with the backing and the sleeves just complete it. I can’t wait to see the whole dress! I’m so excited for this one! I love when I get emails on your new projects, I have to keep a little sewing reference book handy, I learn so much ☺️ Can’t wait for the next post! I love the way this is turning out! 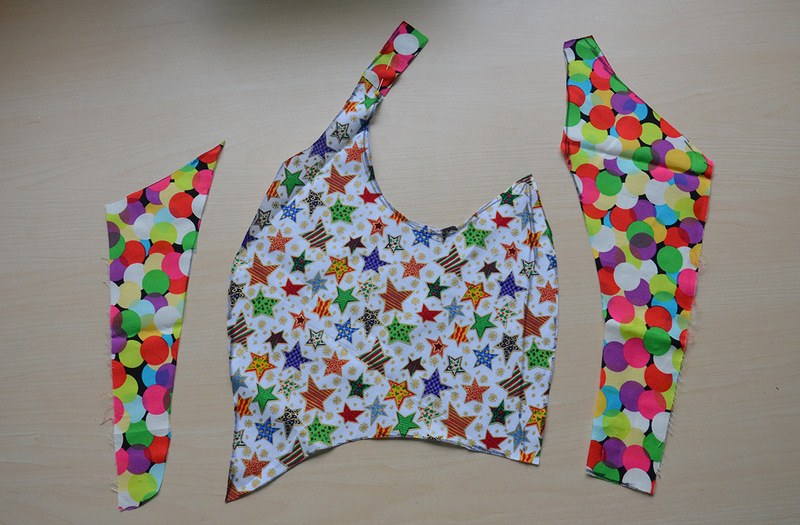 The 2 fabrics for the body look so stunning, and the idea for the sleeves looks really cute! OH MY GOD ITS BEAUTIFUL! You seriously are the most talented gal ever! I love every single dress I see you wear! But this one is my favorite!! The fabric is absolutely stunning!! These are beautiful…. you should make wedding dresses, you would have a fabulous career!